Citation Information: J Clin Invest. 2003;112(5):785-794. https://doi.org/10.1172/JCI18563. Tumors associated with osteomalacia elaborate the novel factor(s), phosphatonin(s), which causes phosphaturia and hypophosphatemia by cAMP-independent pathways. We show that secreted frizzled-related protein-4 (sFRP-4), a protein highly expressed in such tumors, is a circulating phosphaturic factor that antagonizes renal Wnt-signaling. In cultured opossum renal epithelial cells, sFRP-4 specifically inhibited sodium-dependent phosphate transport. Infusions of sFRP-4 in normal rats over 2 hours specifically increased renal fractional excretion of inorganic phosphate (FEPi) from 14% ± 2% to 34% ± 5% (mean ± SEM, P < 0.01). Urinary cAMP and calcium excretion were unchanged. In thyro-parathyroidectomized rats, sFRP-4 increased FEPi from 0.7% ± 0.2% to 3.8% ± 1.2% (P < 0.05), demonstrating that sFRP-4 inhibits renal inorganic phosphate reabsorption by PTH-independent mechanisms. Administration of sFRP-4 to intact rats over 8 hours increased FEPi, decreased serum phosphate (1.95 ± 0.1 to 1.53 ± 0.09 mmol/l, P < 0.05) but did not alter serum 1α, 25-dihydroxyvitamin D, renal 25-hydroxyvitamin D 1α-hydroxylase cytochrome P450, and sodium-phosphate cotransporter mRNA concentrations. Infusion of sFRP-4 antagonizes Wnt action as demonstrated by reduced renal β-catenin and increased phosphorylated β-catenin concentrations. The sFRP-4 is detectable in normal human serum and in the serum of a patient with tumor-induced osteomalacia. Thus, sFRP-4 displays phosphatonin-like properties, because it is a circulating protein that promotes phosphaturia and hypophosphatemia and blunts compensatory increases in 1α, 25-dihydroxyvitamin D.
Citation Information: J Clin Invest. 2003;112(4):503-516. https://doi.org/10.1172/JCI17913. Under pathologic conditions, renal tubular epithelial cells can undergo epithelial to mesenchymal transition (EMT), a phenotypic conversion that is believed to play a critical role in renal interstitial fibrogenesis. However, the underlying mechanism that governs this process remains largely unknown. Here we demonstrate that integrin-linked kinase (ILK) plays an important role in mediating tubular EMT induced by TGF-β1. TGF-β1 induced ILK expression in renal tubular epithelial cells in a time- and dose-dependent manner, which was dependent on intracellular Smad signaling. Forced expression of ILK in human kidney proximal tubular epithelial cells suppressed E-cadherin expression and induced fibronectin expression and its extracellular assembly. ILK also induced MMP-2 expression and promoted cell migration and invasion in Matrigel. Conversely, ectopic expression of a dominant-negative, kinase-dead form of ILK largely abrogated TGF-β1–initiated tubular cell phenotypic conversion. In vivo, ILK was markedly induced in renal tubular epithelia in mouse models of chronic renal diseases, and such induction was spatially and temporally correlated with tubular EMT. Moreover, inhibition of ILK expression by HGF was associated with blockade of tubular EMT and attenuation of renal fibrosis. These findings suggest that ILK is a critical mediator for tubular EMT and likely plays a crucial role in the pathogenesis of chronic renal fibrosis. Citation Information: J Clin Invest. 2003;112(4):554-565. https://doi.org/10.1172/JCI16956. Aldosterone controls the final sodium reabsorption and potassium secretion in the kidney by regulating the activity of the epithelial sodium channel (ENaC) in the aldosterone-sensitive distal nephron (ASDN). ASDN consists of the last portion of the distal convoluted tubule (late DCT), the connecting tubule (CNT), and the collecting duct (CD) (i.e., the cortical CD [CCD] and the medullary CD [MCD]). It has been proposed that the control of sodium transport in the CCD is essential for achieving sodium and potassium balance. We have tested this hypothesis by inactivating the α subunit of ENaC in the CD but leaving ENaC expression in the late DCT and CNT intact. Under salt restriction or under aldosterone infusion, whole-cell voltage clamp of principal cells of CCD showed no detectable ENaC activity, whereas large amiloride-sensitive currents were observed in control littermates. The animals survive well and are able to maintain sodium and potassium balance, even when challenged by salt restriction, water deprivation, or potassium loading. We conclude that the expression of ENaC in the CD is not a prerequisite for achieving sodium and potassium balance in mice. This stresses the importance of more proximal nephron segments (late DCT/CNT) to achieve sodium and potassium balance. Citation Information: J Clin Invest. 2003;112(3):379-388. https://doi.org/10.1172/JCI18038. In fibrotic renal disease, elevated TGF-β and angiotensin II lead to increased plasminogen activator inhibitor type 1 (PAI-1). PAI-1 appears to reduce glomerular mesangial matrix turnover by inhibiting plasminogen activators, thereby decreasing plasmin generation and plasmin-mediated matrix degradation. We hypothesized that therapy with a mutant human PAI-1 (PAI-1R) that binds to matrix vitronectin but does not inhibit plasminogen activators, would enhance plasmin generation, increase matrix turnover, and decrease matrix accumulation in experimental glomerulonephritis. Three experimental groups included normal, untreated disease control, and PAI-1R–treated nephritic rats. Plasmin generation by isolated day 3 glomeruli was dramatically decreased by 69%, a decrease that was reversed 43% (P < 0.02) by in vivo PAI-1R treatment. At day 6, animals treated with PAI-1R showed significant reductions in proteinuria (48%, P < 0.02), glomerular staining for periodic acid–Schiff positive material (33%, P < 0.02), collagen I (28%, P < 0.01), collagen III (34%, P < 0.01), fibronectin (48%, P < 0.01), and laminin (41%, P < 0.01), and in collagen I (P < 0.01) and fibronectin mRNA levels (P < 0.02). Treatment did not alter overexpression of TGF-β1 and PAI-1 mRNAs, although TGF-β1 protein was significantly reduced. These observations strongly support our hypothesis that PAI-1R reduces glomerulosclerosis by competing with endogenous PAI-1, restoring plasmin generation, inhibiting inflammatory cell infiltration, decreasing local TGF-β1 concentration, and reducing matrix accumulation. Citation Information: J Clin Invest. 2003;112(1):76-82. https://doi.org/10.1172/JCI18018. Macula densa (MD) cells express COX-2 and COX-2–derived PGs appear to signal the release of renin from the renal juxtaglomerular apparatus, especially during volume depletion. However, the synthetic machinery and identity of the specific prostanoid released from intact MD cells remains uncertain. In the present studies, a novel biosensor tool was engineered to directly determine whether MD cells release PGE2 in response to low luminal NaCl concentration ([NaCl]L). HEK293 cells were transfected with the Ca2+-coupled E-prostanoid receptor EP1 (HEK/EP1) and loaded with fura-2. HEK/EP1 cells produced a significant elevation in intracellular [Ca2+] ([Ca2+]i) by 29.6 ± 12.8 nM (n = 6) when positioned at the basolateral surface of isolated perfused MD cells and [NaCl]L was reduced from 150 mM to zero. HEK/EP1 [Ca2+]i responses were observed mainly in preparations from rabbits on a low-salt diet and were completely inhibited by either a selective COX-2 inhibitor or an EP1 antagonist, and also by 100 μM luminal furosemide. Also, 20-mM graduated reductions in [NaCl]L between 80 and 0 mM caused step-by-step increases in HEK/EP1 [Ca2+]i. Low-salt diet greatly increased the expression of both COX-2 and microsome-associated PGE synthase (mPGES) in the MD. These studies provide the first direct evidence that intact MD cells synthesize and release PGE2 during reduced luminal salt content and suggest that this response is important in the control of renin release and renal vascular resistance during salt deprivation. Citation Information: J Clin Invest. 2003;111(11):1683-1690. https://doi.org/10.1172/JCI17988. Dominantly inherited mutations in ACTN4, which encodes α-actinin-4, cause a form of human focal and segmental glomerulosclerosis (FSGS). By homologous recombination in ES cells, we developed a mouse model deficient in Actn4. Mice homozygous for the targeted allele have no detectable α-actinin-4 protein expression. The number of homozygous mice observed was lower than expected under mendelian inheritance. Surviving mice homozygous for the targeted allele show progressive proteinuria, glomerular disease, and typically death by several months of age. Light microscopic analysis shows extensive glomerular disease and proteinaceous casts. Electron microscopic examination shows focal areas of podocyte foot-process effacement in young mice, and diffuse effacement and globally disrupted podocyte morphology in older mice. Despite the widespread distribution of α-actinin-4, histologic examination of mice showed abnormalities only in the kidneys. In contrast to the dominantly inherited human form of ACTN4-associated FSGS, here we show that the absence of α-actinin-4 causes a recessive form of disease in mice. Cell motility, as measured by lymphocyte chemotaxis assays, was increased in the absence of α-actinin-4. We conclude that α-actinin-4 is required for normal glomerular function. We further conclude that the nonsarcomeric forms of α-actinin (α-actinin-1 and α-actinin-4) are not functionally redundant. In addition, these genetic studies demonstrate that the nonsarcomeric α-actinin-4 is involved in the regulation of cell movement. Citation Information: J Clin Invest. 2003;111(8):1181-1190. https://doi.org/10.1172/JCI16651. Hemolytic uremic syndrome (HUS) is a disease characterized by microangiopathic hemolytic anemia, thrombocytopenia, and acute renal failure. Recent studies have identified a factor H–associated form of HUS, caused by gene mutations that cluster in the C-terminal region of the complement regulator factor H. Here we report how three mutations (E1172Stop, R1210C, and R1215G; each of the latter two identified in three independent cases from different, unrelated families) affect protein function. All three mutations cause reduced binding to the central complement component C3b/C3d to heparin, as well as to endothelial cells. These defective features of the mutant factor H proteins explain progression of endothelial cell and microvascular damage in factor H–associated genetic HUS and indicate a protective role of factor H for tissue integrity during thrombus formation. Citation Information: J Clin Invest. 2003;111(5):649-658. https://doi.org/10.1172/JCI17189. Preeclampsia, a syndrome affecting 5% of pregnancies, causes substantial maternal and fetal morbidity and mortality. The pathophysiology of preeclampsia remains largely unknown. It has been hypothesized that placental ischemia is an early event, leading to placental production of a soluble factor or factors that cause maternal endothelial dysfunction, resulting in the clinical findings of hypertension, proteinuria, and edema. Here, we confirm that placental soluble fms-like tyrosine kinase 1 (sFlt1), an antagonist of VEGF and placental growth factor (PlGF), is upregulated in preeclampsia, leading to increased systemic levels of sFlt1 that fall after delivery. We demonstrate that increased circulating sFlt1 in patients with preeclampsia is associated with decreased circulating levels of free VEGF and PlGF, resulting in endothelial dysfunction in vitro that can be rescued by exogenous VEGF and PlGF. 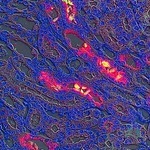 Additionally, VEGF and PlGF cause microvascular relaxation of rat renal arterioles in vitro that is blocked by sFlt1. Finally, administration of sFlt1 to pregnant rats induces hypertension, proteinuria, and glomerular endotheliosis, the classic lesion of preeclampsia. These observations suggest that excess circulating sFlt1 contributes to the pathogenesis of preeclampsia. Citation Information: J Clin Invest. 2003;111(4):515-527. https://doi.org/10.1172/JCI16079. Renal tubulointerstitial injury is characterized by inflammatory cell infiltrate; however, the stimuli for leukocyte recruitment are not fully understood. IL-8 is a potent chemokine produced by proximal tubular epithelial cells (PTECs). Whether nephrotic proteins stimulate tubular IL-8 expression remains unknown. Acute exposure of human PTECs to albumin induced IL-8 gene and protein expression time- and dose-dependently. Apical albumin predominantly stimulated basolateral IL-8 secretion. Electrophoretic mobility shift assay demonstrated nuclear translocation of NF-κB, and the p65/p50 subunits were activated. NF-κB activation and IL-8 secretion were attenuated by the NF-κB inhibitors pyrrolidine dithiocarbamate and cell-permeable peptide. Albumin upregulated intracellular reactive oxygen species (ROS) generation, while exogenous H2O2 stimulated NF-κB translocation and IL-8 secretion. Albumin-induced ROS generation, NF-κB activation, and IL-8 secretion were endocytosis- and PKC-dependent as these downstream events were abrogated by the PI3K inhibitors LY294002 and wortmannin, and the PKC inhibitors GF109203X and staurosporin, respectively. In vivo, IL-8 mRNA expression was localized by in situ hybridization to the proximal tubules in nephrotic kidney tissues. The intensity of IL-8 immunostaining was higher in nephrotic than non-nephrotic subjects. In conclusion, albumin is a strong stimulus for tubular IL-8 expression, which occurs via NF-κB–dependent pathways through PKC activation and ROS generation. Citation Information: J Clin Invest. 2002;110(10):1525-1538. https://doi.org/10.1172/JCI16219.